Bruce and I want to thank you all of you who left comments to my previous post about Connor. Each day is a little bit easier but we are now discovering just how much love and life that little dog added to our home and lives. In the mean time, our frog is back (Pacific Tree Frog) and he brought friends. We're finding them everywhere this fall! I also disturbed a toad hiding under foliage by the front door. I'm hoping our rabbit 'Peter' has found better digs for winter as we haven't seen him in some time. We also have a blue jay who follows us window by window around the house, finds a branch or railing and tells us loudly his opinion on everything! Construction of the deck is all complete now, with just some handrails to finish things up.... and a general clean up will get under way soon .. So lets get back to weaving! I was feeling the need for some bright colours and I wanted to play with iridescent effects again. To get that, you must have some key points at play: balanced plain weave, colours of similar value, finer yarns work better. 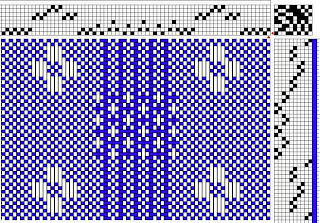 My pattern is for 12 shafts and 12 treadles. Next, I chose 10/2 tencel in Persian Red, sett 24 epi, as my warp and Antique Gold as weft for my first scarf. The colour for the second scarf was undecided at this point. I thought I'd try some sampling and see what I like. I beamed the 6.5 yard warp onto Lilibet, my Louet Spring. The tencel was particularly shiny and slippery! I made a decision to lace on over tying as I knew there would be problems with tie slippage otherwise. Lacing seriously reduces loom waste which can be handy on some warps where you are using expensive yarns. I lace it all on and then used painters' tape to secure the left end of the cord down, then I pull out all the loose tension , working from right to left. 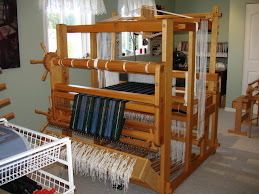 Here I am working quickly and I even added a bit of tension on the warp using the braking system as I moved along. This warp is only 6.5 inches wide and just under 200 ends; the threading is fancy M's and W's twill progressions, and some how I made 3 threading errors which I found one at a time. I would fix one and then find another. In fact, I even made yet another as I fixed number 3! (so that makes 4 mistakes then). I had no idea what was going on for me to mess up like that ( I'll spare you the list... but I think preoccupied is a good one. :) Below is a piece where I thought I was free and clear and then spotted that the last little diamond was suspiciously small. The pink thread has the suspects corralled for the next and final repair. I was sure glad to have used tape on the lacings! Bruce heard me muttering rather rude things.... and all I said to him was "don't ask!" I have tried various angles and lighting to show the colours. Its a tough one to show you accurately as it looks orange, but its not. There are two blocks, A and B, to weave as one repeat and at the end, do the one last A to balance. 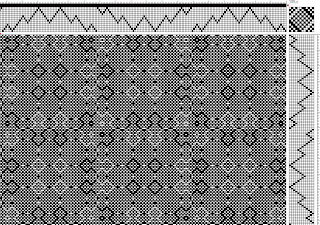 The pattern produces circles and diamonds all within squares! I found this pattern at the wonderful web site Handweaving.net and you can play there for hours! 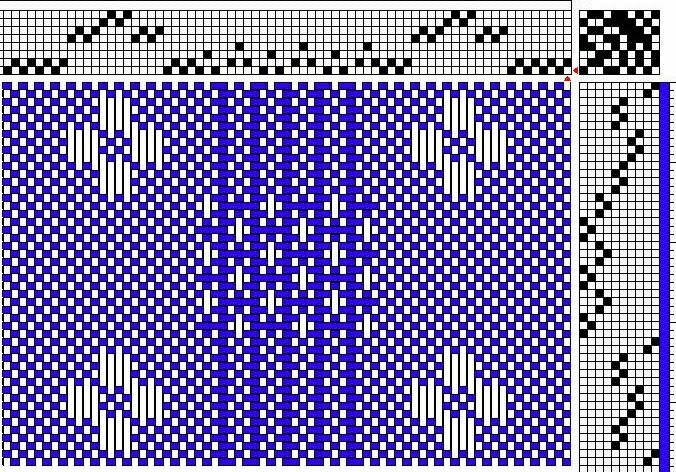 If you have a weaving program then you are free to download WIF files to your program and then convert to what your program uses. I heartily recommend a visit. It features patterns for any number of shafts and treadles! Here as the cloth turns over the breast beam, you get a hint of the iridescence! I played with several colours for the second scarf and none appealed to me, and the black is what I finally went with. It has a sombre Victorian elegance especially next to its brassy cousin! So here you can see the black version that I'm prepping it for fringe twisting. Have you ever found that your warp allowance for fringe is different at both ends? I measured for 12 inches allowances but sometimes one end is shorter, one longer. I fold the scarf in half and pin the ends as shown above and below. See the difference? I like to even things up but placing ends under a cutting mat, holding down with a ruler and zipping off the excess with the cutter. A crisp clear edge and both ends of the scarf have equal length for fringes. That way my fringe twister workout becomes the same number for each warp bout. Just seems like a smart thing to do and thought I'd share this step for those of you trying out my fringing board style. Below both scarves are now pinned out and ready to be worked on. Hard to believe they are from the same warp huh? Below in this picture, I've twisted a bout and pinned it to the line. I release the bout and the excess energy in the twist springs it free. It will now be just a tad longer than the line. I simply count my turns in one directions, combine the two groups and then count as I turn in the opposite direction. If you repeat the same action each time, they should all be more or less the same length. Just some minor variations. The next two shots are to show the iridescence before they even have been wet finished! Our Lakeland terrier, Connor at 8 weeks old. Simply too cute for his own paws! I'll hold it steady for you ..
You are running low on purple Mum....is my ball in there? Okay maybe I did need one.... Are we done yet? Below is a small video ..
Connor doing what he loved best... playing soccer and very good at it too. Let me run a few details by you once more: this 8 shaft project has a warp of 20/2 cream bombyx silk from Treenway Silks, the green variegated is roughly the same size, perhaps a bit finer and is painted by the Fleece Artist. The basic sett is 24 epi sort of.... leastwise that's what the cream is set at. This is where the flowers are created with weft floats, with warp floats on the reverse side. The green warp is where the lace is formed and is actually a little three thread huck lace or also called a mock leno. Here we have to sley the reed three green threads at a time, with an empty dent in between to help emphasize the groups. Simple enough once you understand the principle or have done this draft before. The only difficulty I have with it, is that its seems hard to work out a project width! I plan about two inches shy and when I sley it out it somehow comes to what I need. Here it is in the reed and being beamed on. The green was sort of clingy and I thought I would have trouble with halo'ing but it went on quite slick! This is the denting arrangement and perhaps best seen if you click on the picture to see it larger. The empty dent is only between the greens. No space left between the cream and green. I pinned them out on my fringing board and got to work. I twisted the greens separately first and then worked out an arrangement in the cream sections. Fringe is approximately 7 inches when done. I like a finer, longer fringe on a ladies scarf and this pair say 'dainty'! Now I get to play in my bead box and see what I can come up with! I had taken a sample of the green silk with me to a couple of bead shops and found some exact colour match Japanese Delica beads. I have lots of cream and opalescent beads in the stash. Ta Da! All done.. and buttery soft. On the home front: We have no exterior decks at all. We are naked! Just when the neighbours thought all the banging was all over, tomorrow it starts in earnest! The decking crew arrives first thing and will be here for the better part of two weeks. I'll do before and after shots then. I hope to do some weaving but must admit that there have been many distractions lately! Autumn seems to be a busy time.... oh heck, our whole year has been like this starting back at the beginning with our flood repairs and new kitchen. That's why a "no naked looms" policy works as you can grab 20- 30 mins where you can. See you soon! summer phlox... can you smell the perfume? With just a gentle breeze, the scent of these flowers fill our house! Its the first of September so not many warm days left ahead. The nights have a decided chill to them. The trees and gardens are looking tired. This post is, well, all over the place! In between times for many things. First up I have a picture below that I wanted to include in my post on the Vancouver trip but it was missed. I found a lovely roof top garden next to our building and it looked like an oasis in the city. A lovely Japanese style roof top garden! Next up is the studio. I have steadily worked through all my finishing and you are totally up to date with completed projects. I spent a few days winding warps and have one on Lilibet and two additional spare ones for her. Meanwhile I did another adjustment to the 20+ tie up cords on Emmatrude to prevent irregular sheds and then started to wind another towel project. When in doubt, do towels! Last fall, I made kitchen towels using the pattern 'breaks and recesses' that were very popular with buyers. I like them too as they are a straight 8 shaft draw and same easy treadling as all the pattern is in the tie up. The kind of weaving where you can get just throw the shuttle and get into a wonderful rhythm. No nasty long treading plan to memorize or keep track of. Here are my colour choices on my warping box. The box was made for me by a friend's husband who was a nifty carpenter. The pegs are removable for larger sized cones and the thread is fed up through smooth holes on the top to the warping board above. The green, and salmon pink cones all have a bit of a yellow undertone and so the soft yellow cone works well with them. The plum works nicely with the green and white is the base colour. This is the triadic arrangement on the colour wheel again, except I picked them first and realized the association later! So, this is where the project sits right now and I'll be working on threading and sleying and starting to weave this week. On Lilibet, my Louet Spring 90 I have another reprise of a popular pattern. Last year I made runners using cottons, and when I found a hand painted silk skein by Fleece Artist in soft greens, I saw it coupled with cream silk and featuring "Flowers and Lace" again. I won't elaborate too much on the project here as it will have its own separate post sometime soon, but a few details won't hurt! Its has the green sections of 3 thread huck lace, or mock leno, which is dented three to a dent on a twelve dent reed, with empty dents on either side. The white silk sections are dented 2 per dent (for 24 epi). A bit fussy? perhaps... but look! Its very pretty! I've only just started and now wishing I had done a warp for three scarves and not just the two on the loom. The weft is cream bamboo. Okay! Now for a seismic shift and taking you out of my studio to the Outside! We have more renovations under way again but this time not in the middle of my private spaces. The expansive cedar decking has had its day and is slowly rotting away and its time to be replaced. We plan to rebuild it pretty much the same, but there is a portion we are going to return back to lawn and possibly this fall if weather permits, or next spring. Add two young men with strong backs and eager to get going! First you hire two young men with strong backs and endless energy. Meet Colin and Pat (in red). Colin runs his own yard maintenance business and is a most enterprising young man! They are removing the railing and glass on the upper deck. Add one Hubby who wants to keep up with two twenty year olds! Meet Bruce, who like the young lads, loves to cut things up and play with power tools and tractors. young men love to rip things apart... with power tools! So on day one, the guys got all the lower decks cut up and into the bin and even did clean up of the area. There were tons of little toys under the old deck from children past who used to live here. Most likely they are full grown as the deck is at least 20 to 25 years old. lower side deck and stairs ... gone! ...its gone from much too big, to, maybe too small? The bin is much fuller now and we have lots of upper deck and posts to go yet. I'm actually wondering if it will all fit in now! 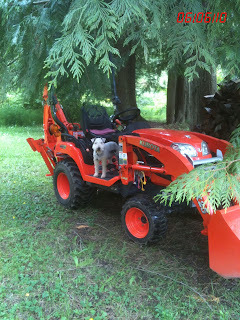 Bruce used the Kubota Kub to remove the concrete footings. The section where he's working is the area we plan to return to lawn. Its level and flat so a load of top soil/ sand mix and a large bag of seed should do it. ... and down she comes! Colin did the cutting and Bruce guided it down with a huge *thump! * They wore big smiles, especially when things unexpectedly fell down and didn't hit something like windows, patio doors... or them! Okay, the bin is full, with more to go in.... so what to do? not only full but trying to make more room! looking smaller and a bit naked!